Sometimes also known as The Book We Cannot Keep In Stock. How funny that this should be paired right next to Ira Sleeps Over on the list. Apparently the mid-90s constitute the anxiety block on our poll’s list. While Ira feared aspects of sleeping over, The Kissing Hand is most frequently cited as the book you use to send your child off to kindergarten. This title falls dangerously close to the realm of the sentimental picture book. However, while books like Love You Forever and others that may or may not appear on this list are reviled long and loud, The Kissing Hand seems to raise no ire. It simply fulfills its purpose in life and continues onward after that. Not surprisingly, it’s a reading list staple for many. Equally unsurprising is the fact that the book has launched many a sequel. These include (but are not limited to) A Pocket Full of Kisses, A Kiss Goodbye, Chester Raccoon and The Big Bad Bully, Chester’s Change of Heart, Chester the Brave, and Chester Raccoon and the Acorn Full of Memories. 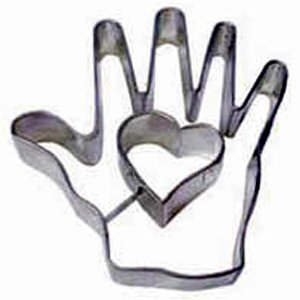 There is a Kissing Hand cookie recipe out there. Though I suspect that if certain little boys got ahold of these cookies they would redub them something along the lines of “bloody hand cookies”, so consider it as a possible Halloween entertainment nosh as well. Another recipe. Less bloody. Interesting because while I don’t think the creator meant them to, the hands look far more raccoony. Yet another recipe. After a while they start to seem Biblical. Or is it just me? I read Chester Raccoon and the Big Bad Bully…words fail me. Let us just say that I weeded it stat. Ugh. As to the cookies, I’d have said stigmata — good for The Blessing of the Animals, or anyone studying Saint Francis of Assisi? At my first school the councilor used this for bibliotherapy. Somehow, when I opened a new school, I forgot to order it. HMMMMMM. rams – stigmata indeed. Hehehe. Stigmata! Of course! So obvious I couldn’t even see it. Kicking myself now. Aww, I love this book. I read it on the first day of school to my preschool class every year and we do a little craft for mom to go along with it. It’s definitely sentimental, but I still like it. My son’s kindergarten teacher read this aloud on the first day of school, then shuffled all of us teary parents out the door. Unfair!